Back in my Polish flat mere hours before the closing ceremony of this year’s festival—my elbows still sore from fighting my way into press screenings—I duly watched the verdict unravel upon my Twitter feed, hitting the ‘refresh’ button incessantly as award after award proved to be either disappointing or infuriating. Having not seen Thomas Vinterberg’s The Hunt (the only competition movie I missed), I cannot assess whether Mads Mikkelsen’s turn was indeed more impressive than Denis Lavant’s batsh*t vaudeville in Leos Carax’ completely shunned Holy Motors, but still I find almost every decision of the jury risible. Save for the Palme d’Or itself—awarded to Michael’s Haneke’s Love—and Camera d’Or for Benh Zeitlin’s Beasts of the Southern Wild—which wasn’t even a Cannes premiere, but never mind—the rest of the verdict seems flat-out wrong to me. Cristian Mungiu’s painstakingly self-important Beyond the Hills took the best script prize that should have gone either to David Cronenberg for his masterful adaptation of Don DeLillo’s Cosmopolis or to Abbas Kiarostami for crafting a baffling labyrinth of a cerebral screwball comedy that was Like Someone In Love. 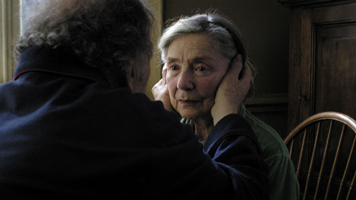 Mungiu’s two leading actresses—Cosmina Stratan and Christina Flutor—were also awarded for their largely one-note performances, thus leaving Emmanuelle Riva’s stunning turn in Haneke’s Love unmentioned. As my own review of it testifies, I liked Matteo Garrone’s Reality a great deal, so I’m happy it got the Grand Prix—and yet feel like it came at too great a price, with Holy Motors so glaringly missing from the verdict. The Prix du Jury for the unbearably folksy and half-cooked The Angels’ Share, in which Ken Loach sentimentalizes the working class yet again (adding a dash of patronizing attitude), is just another reason to grumble—if not an outright slap in the face for the explosively inventive Carax. The best movie of the fest did win, however. Haneke thus joined the slim (and motley) group of double-Palme winners that includes Francis Ford Coppola, Emir Kusturica, Shohei Imamura, Bille August, and the Dardenne Bros. The fact that this year’s masterpiece triumphed side by side with some of the fest’s weakest entries doesn’t diminish its success, but whoever felt the electric excitement of a collective discovery once the credits rolled for Carax’ Holy Motors, must feel that the verdict is a cop-out.